As the City of Buena Park’s Chief of Police, I am pleased to have the opportunity of introducing you to the Buena Park Police Department. Through the helpful information contained in our website, you will find that our agency is committed to addressing the concerns of our community. You will also discover the various services we provide to the citizens of Buena Park. Credit for our success belongs to the guidance and direction demonstrated day-after-day by the Police Department’s Leadership Team, as well as the hard work being accomplished by the many members of our organization, and also the members of our community that we have built partnerships with. With the many challenges that face law enforcement today, I am extremely proud of our ability to adapt and remain steadfast in our commitment to providing the best possible police services to our City. 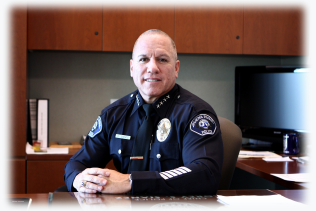 I encourage you to navigate through our website, which reaffirms our commitment to proactively and responsively addressing the needs of our community, enhancing our public safety services and improving the quality of life in the City of Buena Park.